Happy Friday! 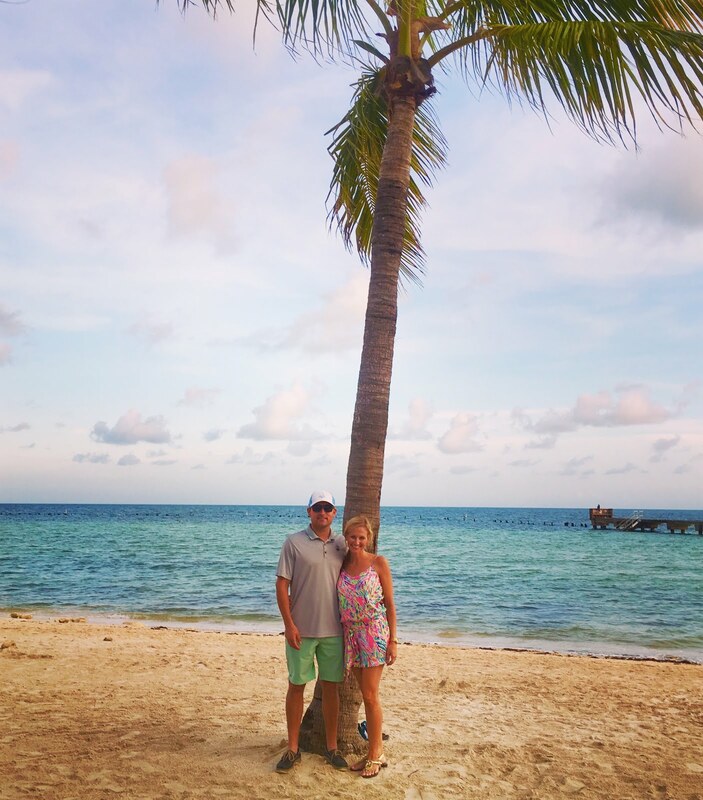 Since I got back Monday afternoon from our Key West trip this week has seemed super short, but it has also been super busy. It is just hard to be gone while the kids are in school and I have felt like I was playing catch up all week. I couldn't be more excited about a long weekend ahead of us! Today I thought I would share some of what I've been wearing lately. I always love seeing other bloggers outfits when they share so hoping y'all will enjoy this, too. If I'm being totally honest, a lot of days I look like this. 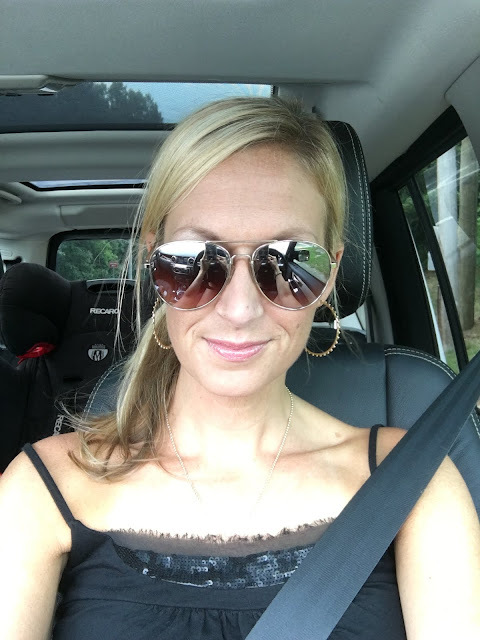 If I take one of my workout classes in the mornings or go walk with my dog, I usually just go about my day of running errands, carpooling and keeping up with the kids unless I have some reason to get dressed up. When I started looking back at all of these pictures I realized that I wear a lot of solids and dress it up with fun accessories. It can totally change the look of an outfit. For example, I wore this very old solid brown cotton sun dress to open house at the school one evening. I wore it with wedges and this necklace. 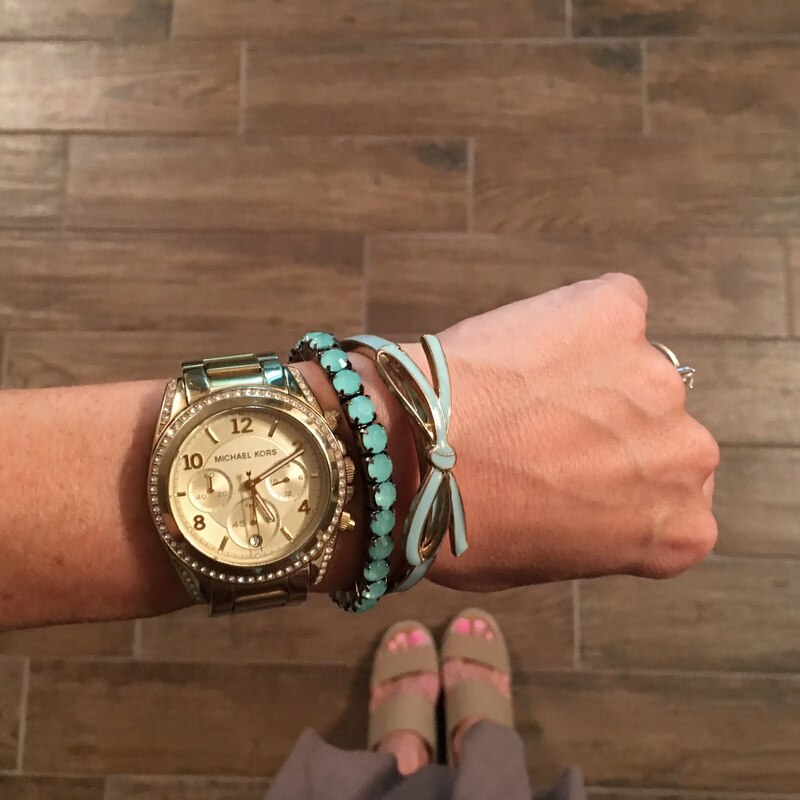 I also had on my gold watch and fun bracelets. 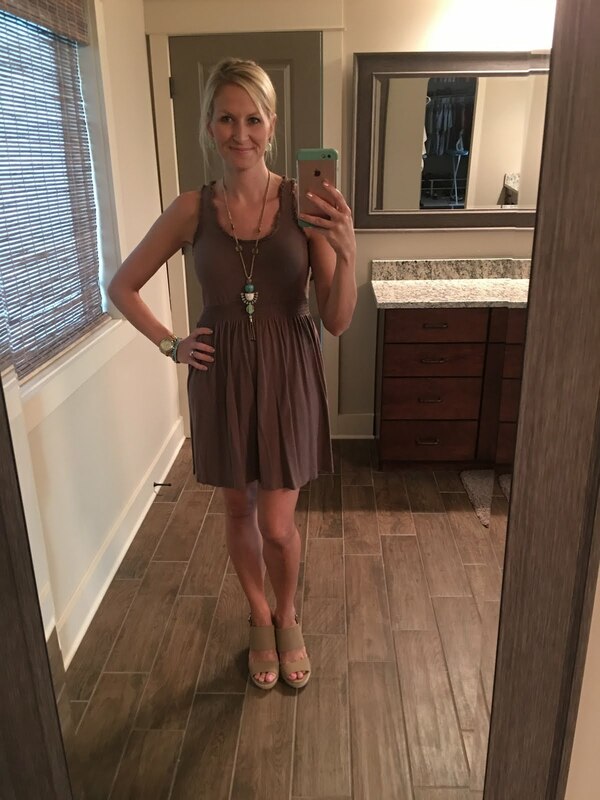 Well, because I only had the dress on about an hour and a half the night before it didn't get dirty and I knew I wouldn't be seeing any of the same people again so I wore it the next morning to my hair appointment and just wore flat sandals and one of my DIY Tassel necklaces. When I don't have on a comfy dress, I usually am in shorts. J Crew shorts are my favorite. I like the way they fit, I know my size so I can order online, and they come in so many fun colors and patterns. I still wear them with a lot of solids and basic tops and dress it up with accessories. My leopard belt remains one of my favorites! 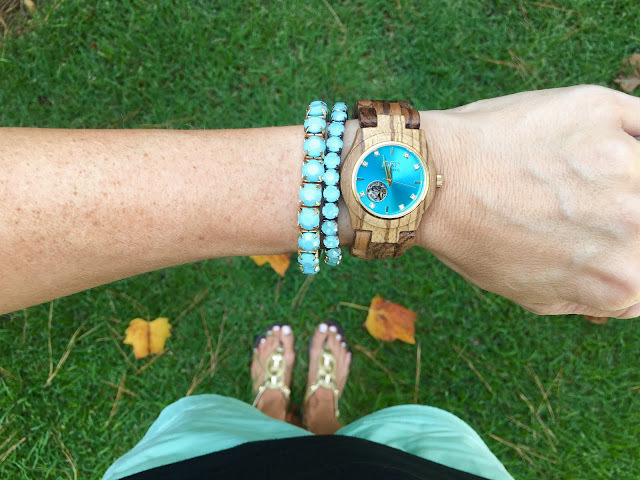 And my JORD watch has been getting a lot of face time, too! 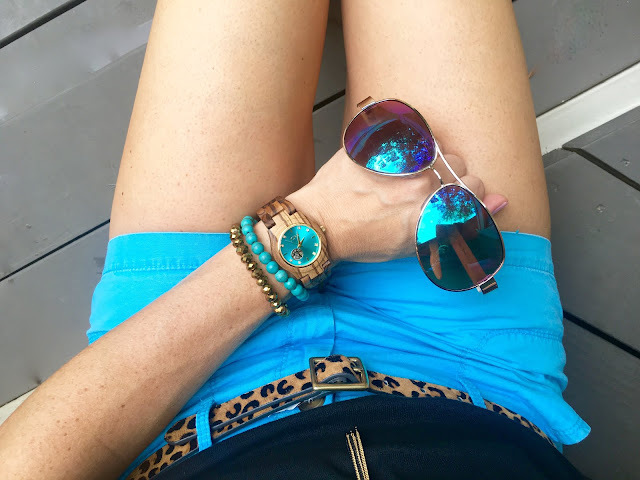 I also love these J Crew shorts with colored tees and a necklace. It kind of dresses up shorts and a tee and makes me feel more put together. 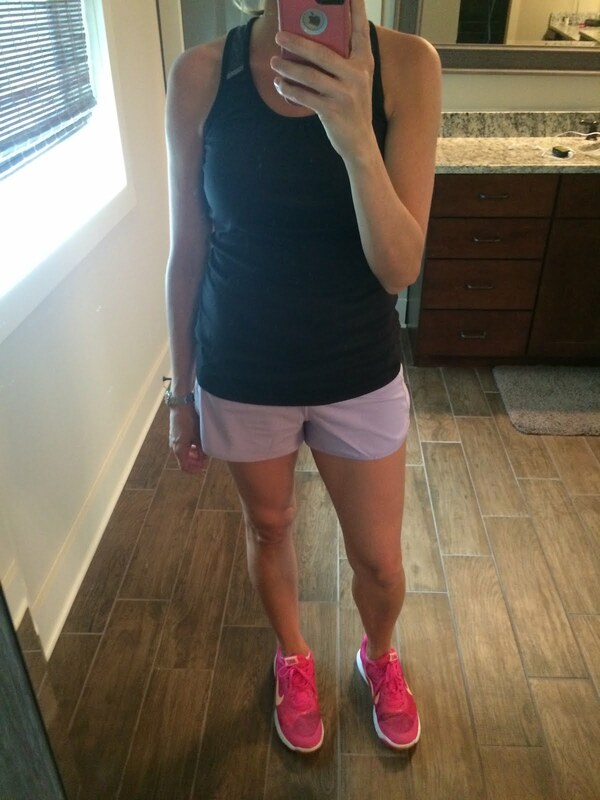 The shorts are a great price right now and it's a great time to stock up on some fun colors for next summer! 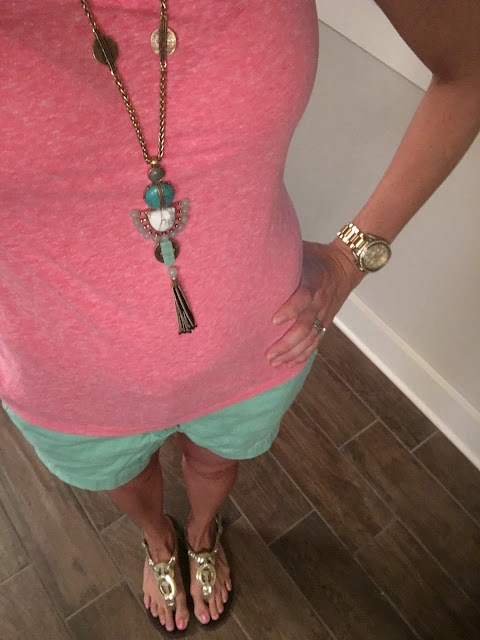 Here are the same mint colored shorts and necklace paired with a black top I found on clearance at Target for about $8. I love me a good sale! And again my fun watch! 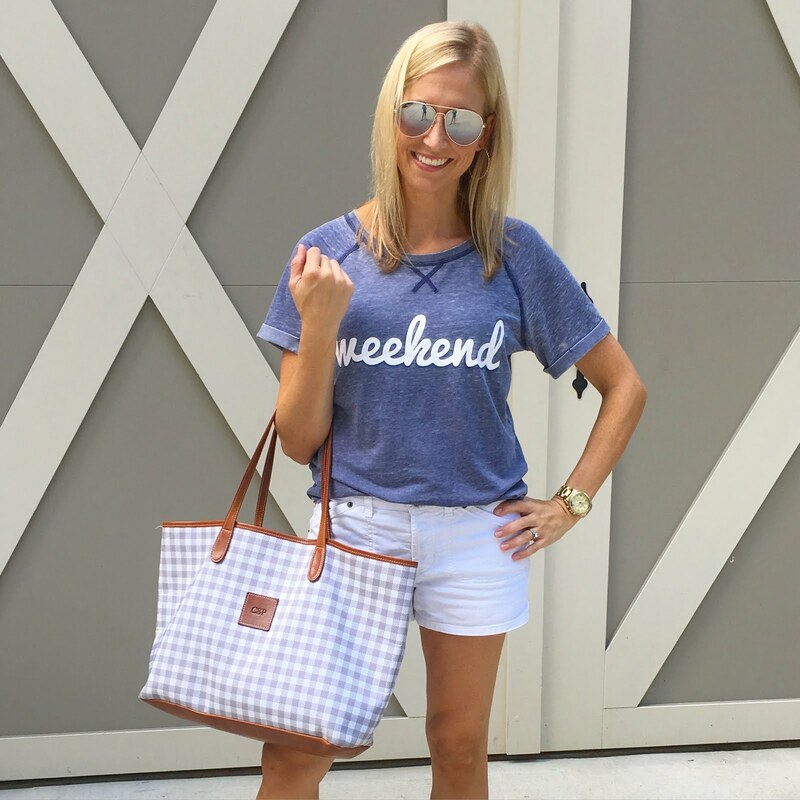 One of my go-to outfits lately on the weekend has been my weekend tee. Seriously, this thing is SO soft. I found it at Target on a whim and it was less than $15 so it had to come home with me. It is sold out online, but check your stores! Also love my Barrington tote. It is a great mama bag with plenty of room for all of everyone's things! And this was me on the way to pick up Blondie from a birthday party and before we were all heading out to dinner with our neighbors. I wanted to show my earrings because, well I love them! I had my eye on them for so long and finally bit the bullet and bought them. I have worn them SO much and highly recommend them if you love big hoops. The little details on them that make them different than plain hoops is what put me over the edge. Now, since it's September now and in my mind Fall is right around the corner, I'd love to start doing a little transitioning with my clothes. However, it still feels like summer. Pretty sure my car said it was 97 degrees today. That is just plain HOT! I'm not one of those people that can start wearing jeans when it is still toasty outside. 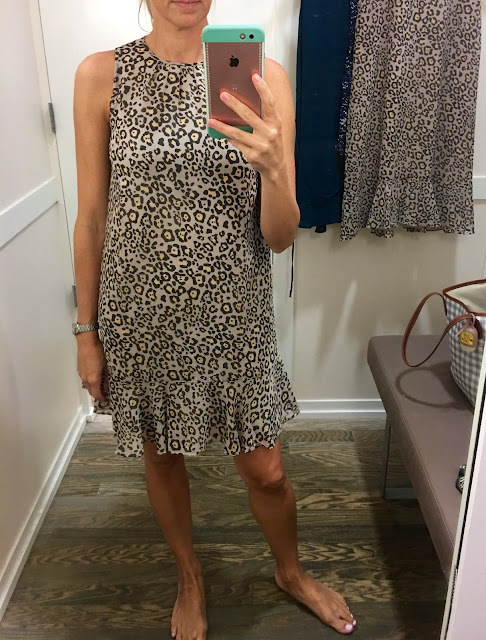 I'm in shorts until I get goosebumps on my legs so transitioning to Fall can be kind of tricky, but I feel like darker colors and patterns can make outfits feel more like Fall, even if it is still warm. A few weeks ago I was on the hunt for a dress to wear to the pageant I was judging and while I was doing that I decided to scope out some cute things for transitioning to Fall. Basically things I could wear now and also into Fall. I stopped by The Avenue East Cobb and started walking around. I tried on lots and found some cute things so I thought I would share my dressing room diaries with you. Don't mind the yoga pants and ponytail. I'd just come from a barre class! The first place that caught my eye was Talbots. Now, Talbots usually makes me think of my late grandmother. I remember shopping there with her when I was little and she bought pretty much the majority of her clothing there. While some of the styles cater to older women, they had some really adorable trendy things, too. Plus, they were having a HUGE sale. 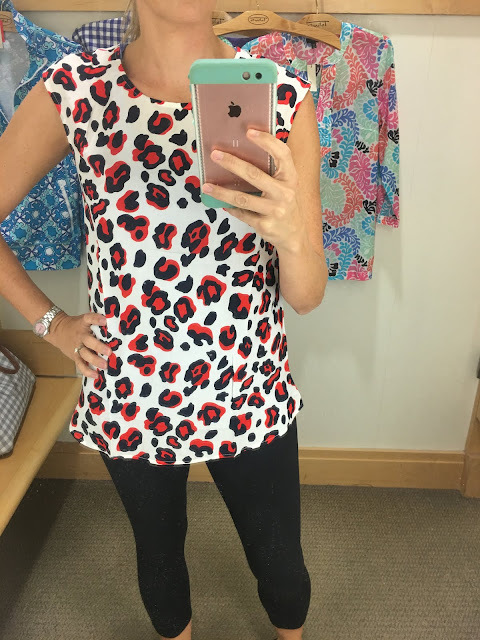 I saw this top from the window and knew I had to try it on. I love anything leopard print and the colors of this were so fun. It's red and navy even though it might look black in the pics. The fabric was so soft and I thought it would be cute with shorts and a denim jacket now and then with jeans when it cools off. 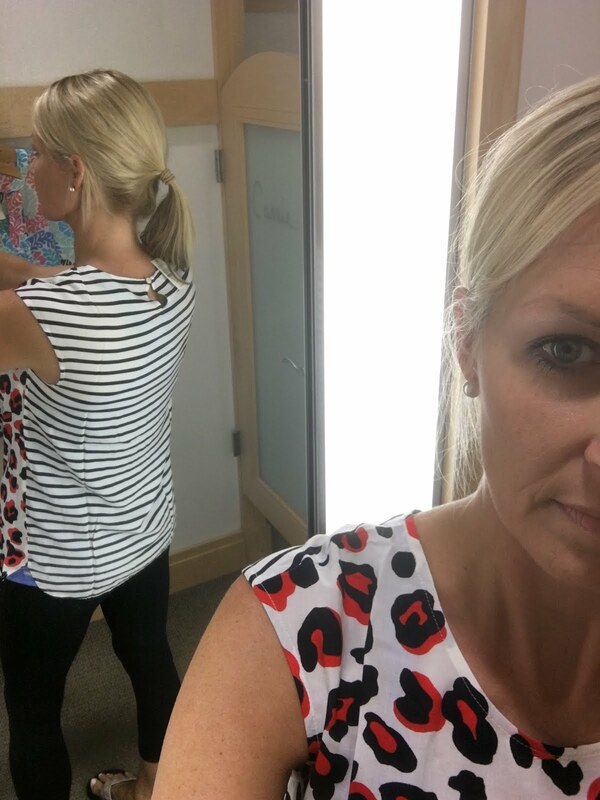 And look at the fun contrasting stripes on the back of the shirt. So fun! Next I popped in Loft and guess what I found...more leopard print!!! This dress was light and flowy. I could wear it now with sandals and add a denim jacket when we have cool mornings and then put it over leggings and boots with a denim jacket when it gets really cold. 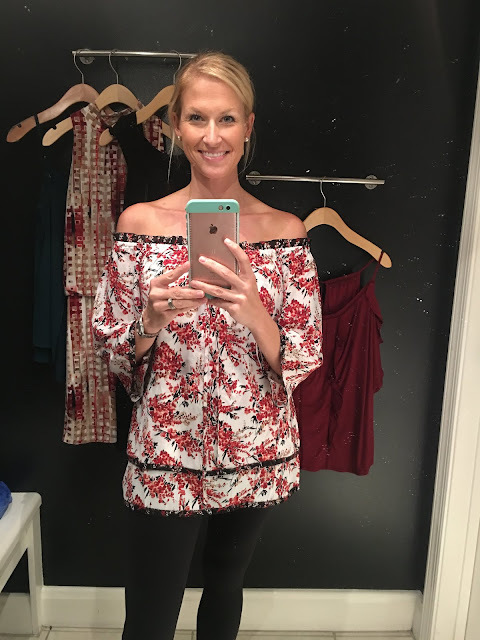 I also loved this top from Loft. 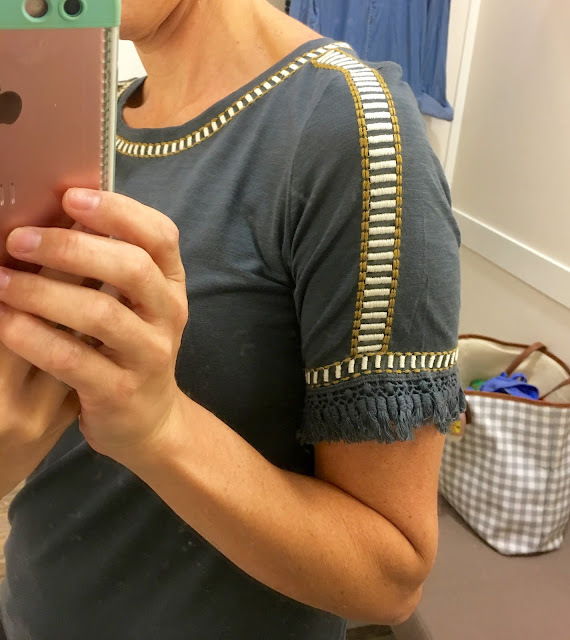 It's a t-shirt, but with some added little details to the neckline and around the sleeves that dresses it up a bit. I could not find the link online, but I'm sure it is in stores. I figured it would be cute with shorts now and with jeans later on. My last stop was White House | Black Market. Their stuff is more dressy, but so pretty! 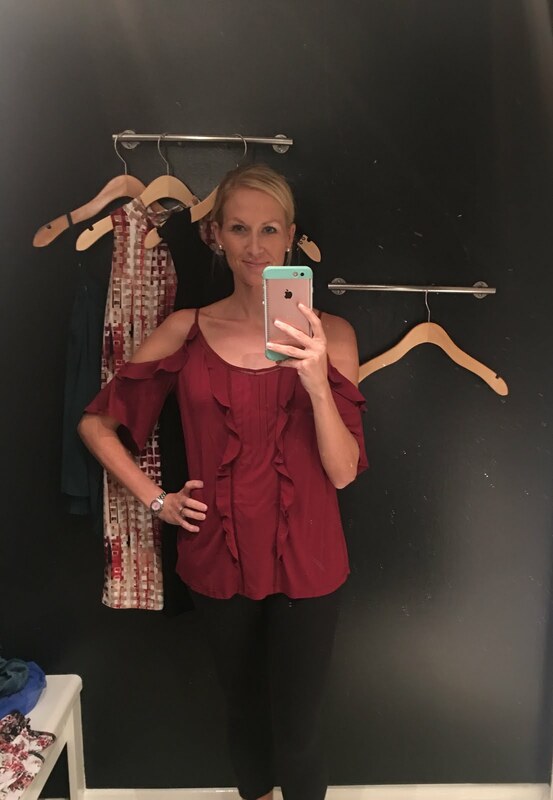 I love the cold shoulder look and this wine colored top with the ruffles was super soft. I love the color because it looks more Fall, but it has short sleeves so I won't be dying of a heat stroke! And then I tried on this off the shoulder top and fell in love with it. It is long enough to wear with leggings and loose enough to be comfortable. 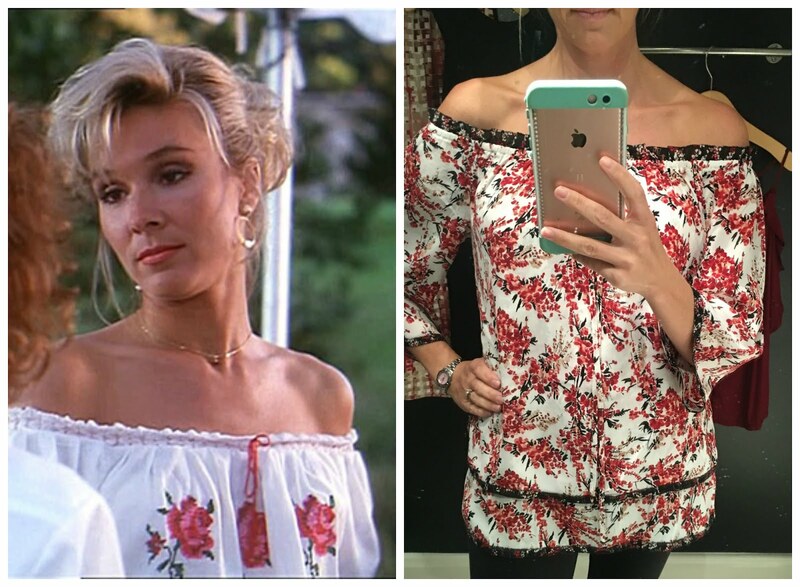 It could probably be worn on or off the shoulders, but I loved it off the shoulders because it made me feel like Penny from Dirty Dancing! Y'all like my side-by-side comparison? Ha! Seriously though, so cute and it's the perfect colors...red and black. Just in time for football season. Go DAWGS!!! That's it for my Fashion Fix this week. We hope everyone has a wonderful Labor Day weekend and we will see you back here on Tuesday of next week!